If you like to cook, you probably grow herbs. 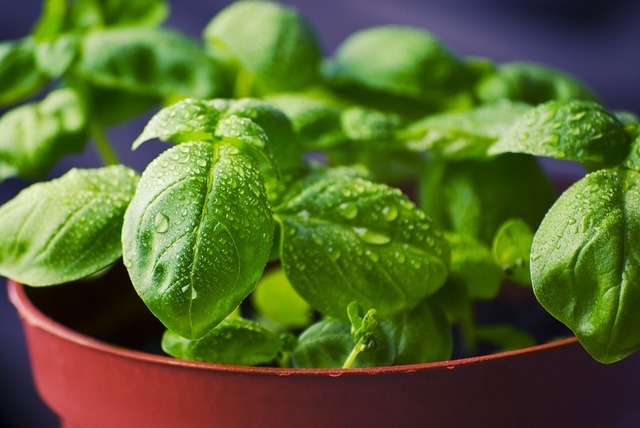 Some gardeners grow their herbs together in large containers, but that can be disappointing since each herb has preferred growing conditions and so one or another is potentially not doing well. Of course, you could give each herb its own container but you still need to keep their similar needs in mind and group the pots or containers together for watering and light requirements. Some advantages of using containers: you will be able to move the containers to accommodate the changing needs of the herbs throughout the season, pests and weeds can be more easily spotted and controlled, and the herbs are easily accessible for gathering. Currently most containers are a type of synthetic or plastic, but clay pots are still available. All containers demand frequent water and the smaller the pot, the more watering it will require. Frequent watering means plant food will need to be added to replace the nutrients that are washed out. Adding natural, organic fertilizers every two or three weeks can improve the fertility and structure of the soil resulting in a rich final product with strength and improved flavor. Remember, good container drainage holes are important or the plants’ roots will rot. Even if grown in containers, plants need mulch to protect their roots and conserve water. It is perfectly fine to use available potting soils for containers. They usually offer a combination of perlite, peat moss, vermiculite and sand. You will notice that actual soil is not in the mix. I recommend using a good organic potting soil as a beginning and adding a couple of cups of a compost to the mix. This will increase the nutrients available to the herbs and start them off well. Here are some guidelines for grouping similar herbs together in a container or in the same area of your garden so you can provide what each of them needs in a confined space. Sweet Bay (Laurus nobilis) is a woody perennial that really needs its own pot. Buy it as a small potted tree, then repot in good potting soil as it grows. Placement in dappled shade will avoid sunburn on the leaves. It likes a good, fast-draining soil to eliminate overwatering. Oregano (Origanum heracleoticum), thyme (Thymus vulgaris) and Sage (Salvia officinalis) are sun-loving perennials that like moderate moisture and are moderately drought tolerant. All are plants that can be cut and used often to maintain a compact shape. They hate to be over-watered. 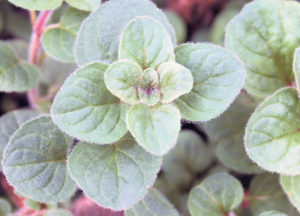 Basil (Ocimum spp.) 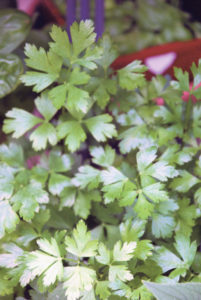 and Parsley (Petroselinum spp.) 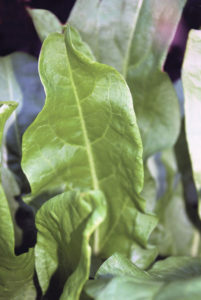 are both soft stemmed, leafy plants that love a sunny location, lots of water and rich, well-drained soil. Pinching out the tops will encourage them to keep a compact shape. Each plant has a single tap root so if the main stem wilts and dies, the plant will not send up a new shoot. To keep these herbs going all summer, start another pot from seed a few weeks after the first for a succession of these herbs all season. Chervil (Anthriscus cerefolium) and Garden Sorrel (Rumex acetosa) are both leafy plants that grow best in rich, moist soil in semi-shade. Chervil does not like to be transplanted so plant it once in the pot and leave it. Lavender (Lavendula spp.) 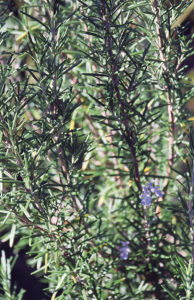 and Rosemary (Rosmarinus officinalis) both love rich, dry soil, well-drained and placed in full sun. Buy both as potted plants because seeds take too long for you to enjoy the rewards. Both need a deep pot to support the small shrub that they will become. French Tarragon (Artemisia dracunculus) and Lemon Verbena (Lippea citrriodora) can be combined in a pot together. Both are shrubby plants that love rich, well-drained soil and full sun. Both can be cut and used in your kitchen often. This will maintain a compact plant and keep them growing new leaves for you to use. The Long Island Horticultural Society meets on Sunday afternoon in the Hay Barn at Planting Fields Arboretum in Oyster Bay. The next meeting in the Planting Fields Conference Center is June 25. The program will include Growing Jamaican Vegetables and New Invasive Insects on Long Island. For more information, go to www.lihort.org.